Size : 15.0 x 19.3 inches. / 38.2 x 49.0 cm. Description :"Uncommon detailed steel engraved map of the United States. Published in Edinburgh by Daniel Lizars. 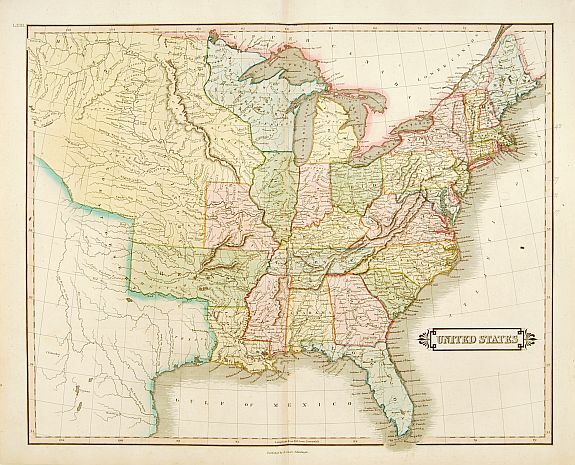 A detailed showing the states and territories from Missouri eastward. Interesting features include a united Virginia, Illinois and Indiana somewhat misshapen (probably due to errors in the path of the Mississippi and Ohio Rivers), and the area north of Illinois (including the northern part of Michigan) is designated simultaneously as ""Northwest Territory""."